We return to our topick of front-driver cycles this week, though I don't know why I trouble myself to say "this week" since my blog entries are stunningly irregular and undisciplined, rather like their author. I had to go to Richmond recently to a citizenship ceremony to watch some people pledge allegiance to Queen Elizabeth the Second (sic.) of New Zealand. I have been unable to find out who Queen Elizabeth the First of New Zealand was. 'A high standard of dress' was required. National costume of country of origin was encouraged. All the participants turned out to be English chavs and dressed accordingly, with a high standard of gelled spiked hair. They looked like they'd all escaped from the Shelthorpe Road housing estate in Loughborough where bus drivers are shot at with airguns. However my wife then went off to the shops and I called on Jim Matthews at Village cycles and he let me have a go on his 36er penny farthing. It has 36 very thick spokes, a cheap chromed steel hub and steel rim, poxy welding, a thin backbone (guess: 38mm OD) and longish cranks, perhaps 165s. The fork was a bit feeble, methought, but obviously adequate for a plaything. Plain straight chromed steel cheap handlebar. It has a partic'ly narsty sprung foam-cushioned plastic saddle and a back brake on a 12 inch wheel. The front tyre is industrial strength and looks like it'll never, ever need replacing. Think Honda 90 robustness. Which brings us back to our topick of front-driver cycles because we've been having a lot of weather in April but then so has everybody, what with wildfires in the parish of Scotland and tornadoes in the parish of Auckland. In Motueka's case it meant a month of solid rain, if you can have solid rain. In fact it's all been a bit exciting. I used to keep a climate scientist (Cambridge, PhD, did sums in his office for me all day) at the Met Office and when grilled annually, he gen'rally reported that their best prediction as the planet warmed was of random wild weather events. So it's all most pleasing that the predictions are now coming true. Unfortunately, though, it means we're forced to think about bicycles that you can ride with impunity in the wet. My wife has been nicking the Official Rain Bike which is a Dutch roadster with enclosed chaincase 3 gears and hub brakes and reminds me of Heinz Stueke, so I have been devoting thought to No Chains or Brakes, which rust after a rainstorm. Unf. 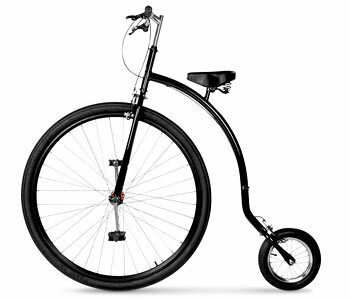 to make a 36er penny farthing I should need spokes and a rim and a tyre and an inner-tube, which would cost $305, and I am Mr Mean-Pants when it comes to $305. 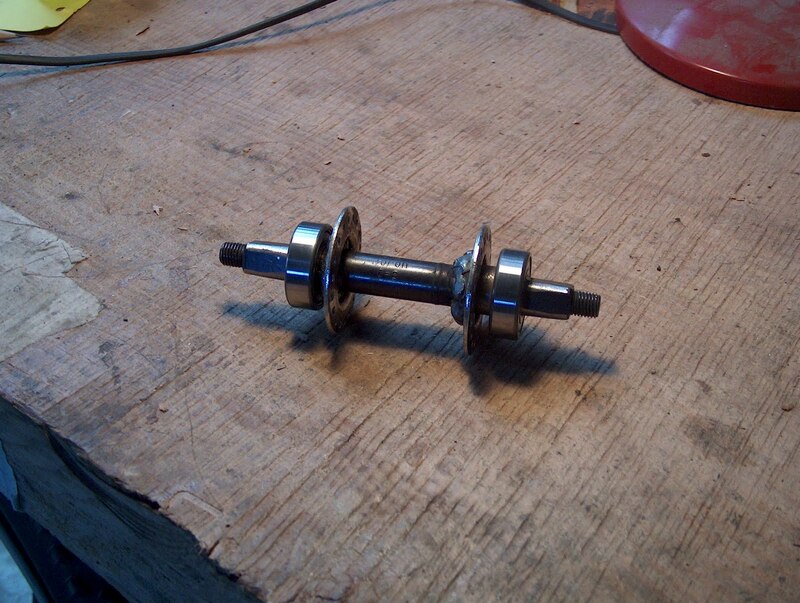 So I had recourse to Mr Schroder's short cranks that he kindly drilled & tapped for me, and Mr English's 5/8 bearings that he kindly brought from the parish of America for me, and I was dismayed to find the bearings would not slip over a knackered old BB axle that I hauled out of a tin where I had been keeping it along with a lot of other junk. Now BB axles are case-hardened, and my lathe doesn't like case-hardening, so I took it to the bench grinder and with frequent checks with a Vernier, allowed it to spin against the grinding wheel and to my vast delight brought it to a tolerable sliding fit. And thence to a sawn-up hub for the flanges, and behold! with the help of a couple of spacers because the cones on t'axle weren't quite big enough to fit inside the flanges, and a little weldery, a penny farthing hub.